I love it when my husband creates a sauce so good, I’m up late thinking of other things to put it on. So far, I’ve come up with: noodles, eggs, gnocchi… and just straight licking it out off a spoon. Seriously, I was awake past midnight. But why am I torturing myself? This Thai Green Curry Sauce is so good on lightly fried white fish and rice, I don’t know why I bother. The verdant green sauce and its fresh, herbacious, spicy bite go perfectly with tender white fish and coconut-scented white rice. Frankly, I had no idea that green curry was so delicious. 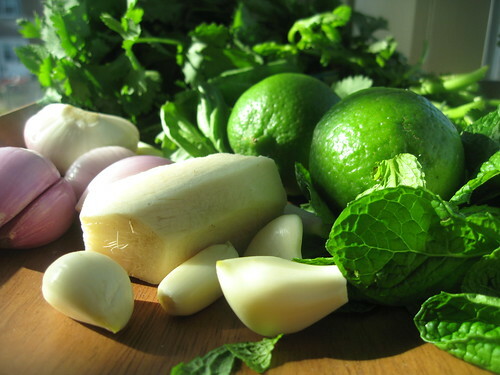 For those new to green curry, don’t be alarmed by its vibrant green color… this is not a disturbing liquefied salad or some sort of wheat-grass-based health beverage. 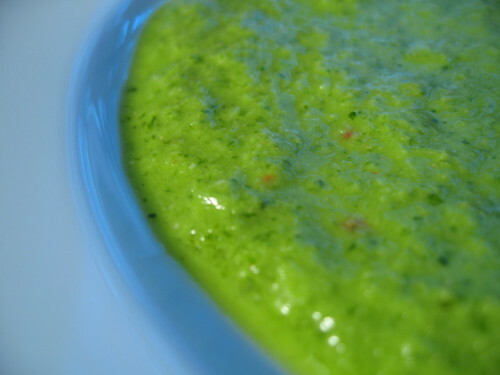 It is a vibrant, fresh, amazing herby concoction, complete with a hint of hot. In fact, call it pesto, if it makes you more comfortable. I don’t really understand the distinction anyway. The point is: It’s amazing. My husband plates this dish up beautifully… a perfectly lightly golden-fried fish fillet atop a steaming mound of aromatic rice, all resting on a lake of this gorgeous green curry. What do I do? Wreck it, man. Ram my fork through all the ingredients. I break up the fish in one go. I stir the rice mound to a chaotic pile. And most important, I coat EVERYTHING in green curry. I want a mouthful in every bite. Only decorum keeps me from picking up the plate and licking the remnants off. Hmmm… Maybe what would really go well with this dish is some bread. Yes, some delicious bread to mop up sauce with. Eureka! I have found it. Now maybe I can get some sleep. Authentic… no. Can’t claim that it is. I’ve made this with Thai basil, bird chilies, galangal (a variant of ginger), and other more rarified ingredients. 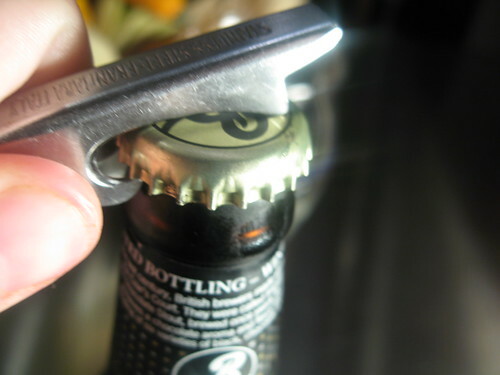 Those are great when you can get them, but at some point you need to use what you have. So, I’ve tried to keep this version to my more regularly available ingredients. 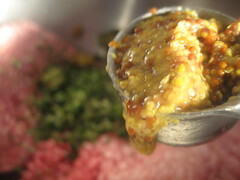 As a result, this sauce has become one of our staples. It is one of our favorite combinations with white fish. Along with some rice, it is fantastic. 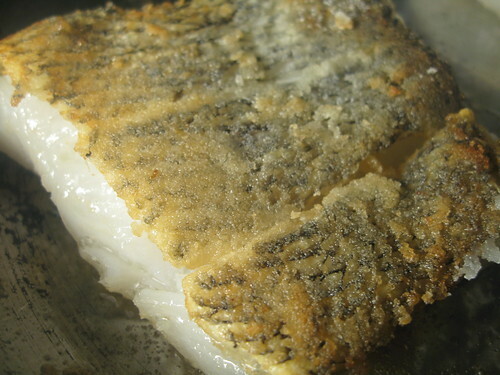 I’ve made it with sea bass (as seen above), pompano, halibut, and hake. It’s really fantastic with any of the firmer fleshed white fishes as the sauce brings lots of acidity as well as its own deliciousness. I’ve also used the sauce to entice non-fish eaters into the fold… and had it ordered by my insistent father-in-law when he returned home from a fishing trip. Luckily, this is also a quick recipe. It takes about 10 minutes to prepare and most of the time is spent shoving ingredients into the blender and running back and forth to the fridge. I suspect Rachael Ray’s frightening efficiency in the kitchen would transform this into a 1 minute sauce, but I’m not always well organized when I have this many ingredients. So, while my recipe may lack ‘authenticity,’ it makes up for it with deliciousness and speed. 1. Add the cilantro (stem and leaves) to a blender. 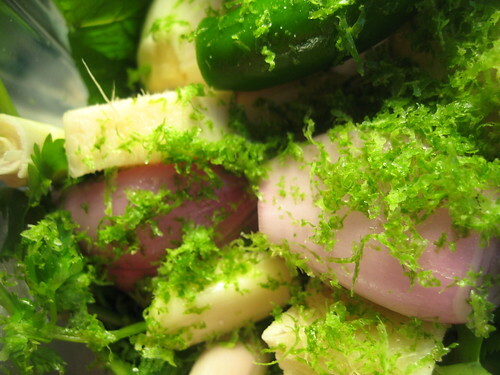 Add the leaves of the basil and mint along with the kaffir lime leaves, lime zest, lime juice, and coconut juice. 3. Add the sugar, cumin, red pepper flakes and salt. Blend for a moment. Taste and adjust seasoning as needed. 4. Keeps well for at least 1 week in the refrigerator. To reheat, place in a pan over very low heat. If you heat too fast, it will cause the sauce to take on a shade of brown .Sauce also will heat well in the microwave for about 90 seconds. Reminder: We are giving away copies of my wife’s and grandmother’s book. Just participate in our holiday traditions event. “Oh Christmas Tree, Oh Christmas tree…” or perhaps, “Santa Baby, slip a sable under the tree. These are some of the lyrics that will invade our subconscious in the coming days as we navigate holiday parties. We’ll all try to drink, eat and be merry as we rub elbows with friends we’ve may have seen earlier in the day shopping at the supermarket, or that acquaintance, who turns out to be your best friend’s brand new flame, that you’ve not seen since last year’s party, or just a chance to get together with your aunts, uncles, siblings, and parents with the buffer of friends and without the formal requirements of carving a roasted beast. Whatever the invite list, odds are you are going to be there a while. Someone is going to have the radio or the cable music channel set to “sounds of the season,” while you try to maneuver a drink, a fork, a napkin, and full plate with two hands and try to keep your Christmas sweater from needing a trip to the dry cleaner’s before Tuesday’s office Christmas party. Now I could make a suggestion about delicious hors d’oeuvres. We have plenty in our recipe index, but I’m actually going to speak to the bigger foul — the beer. Oh, I know some of you people don’t drink or think you don’t like beer. Heck, I didn’t like beer until a couple years ago, and the still wife looks at me funny sometimes. But, people, we can do better than Bud, Bud Light, et al. One of the best things I learned about beer is that it is more like food then you might think. It’s got its seasons. 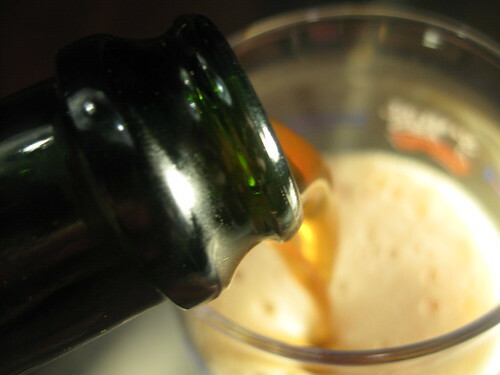 In the spring, you drink the rich bochs developed by monks as “liquid bread” to sustain them through the fasting of lent. In the summer, you drink pilsners and lagers with their light crisp styles. In the fall, you drink harvest beers and sometimes delicious pumpkin ales. 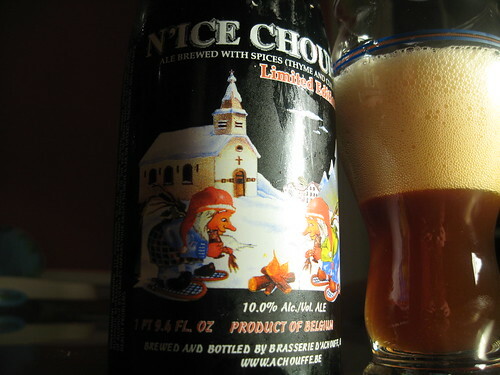 At this time of year, you drink Christmas beers. Now, some of them are bad, and tragically so. Yet there are a few really great ones, brewed with things like dried cherries, honey, cinnamon, thyme, and orange peel. The results are some delicious beers that stand up to cheese plates, fatty finger foods, and even some delicious sweets. So these are my recommendations to replace your big case of Rolling Rock. The one warning is that all of these are rather ‘high test.’ They have more in common with drinking a glass of white wine than your normal beers. So, warn folks who enjoy their beer, or you might find people frisky in the coat closet. 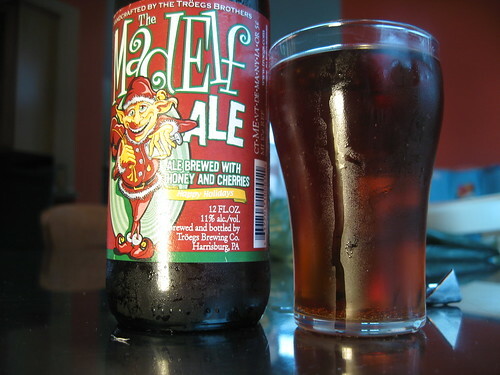 Troeg’s Mad Elf (11% AbV)— This Pennsylvania brewer combines cherries and local honey to create this slightly sweet and medium-bodied beer. 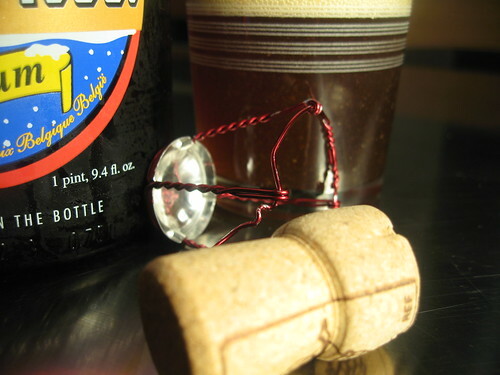 It’s got nice carbonation that keeps it light enough to pair well with a lot of foods. But, in general, it’s a joy to drink. 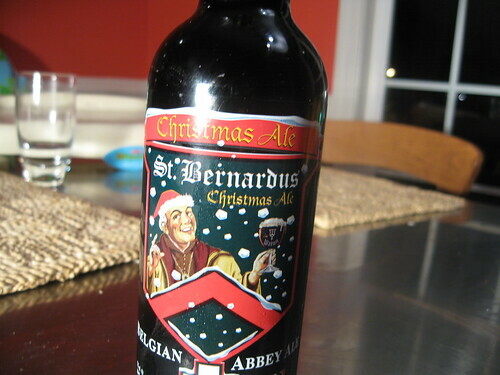 St. Bernadus’ Christmas Ale (11% AbV) & N’ice Chouffe (10% AbV) — Both are classic Belgium Christmas beers. 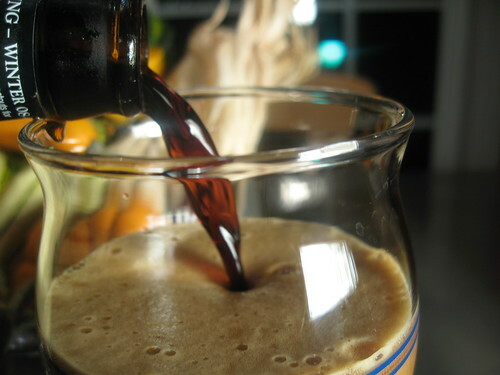 Brewed with orange peel, they are dark brown, spicy and medium bodied. Lots of good dried fruit flavor in both beers. 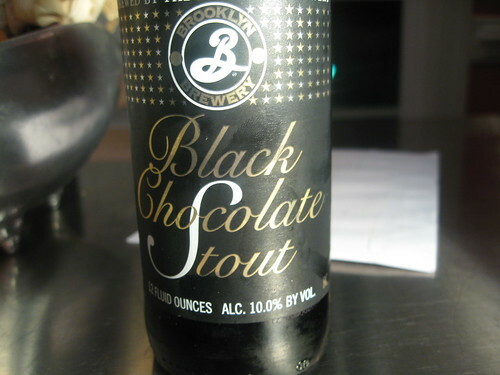 Brooklyn Brewery’s Dark Chocolate Stout (10% AbV) — This is on my short list of all-time favorite beers. This beer tastes so rich and full of chocolate, it’s amazing to realize this flavor is created only by the blend of roasted malts. 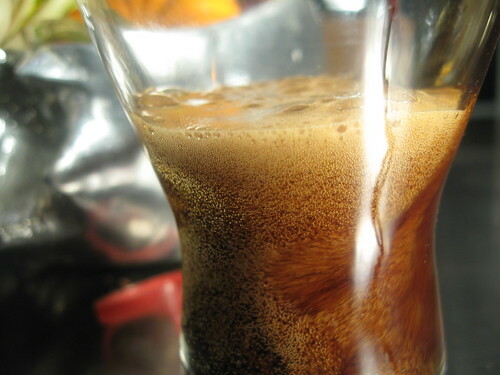 It’s creamy and has good carbonation. 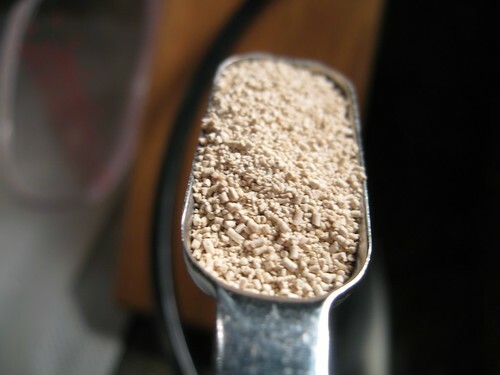 This can be served across a chocolate dessert instead of coffee, or surprisingly, against a pungent cheese. I’m a huge fan and it is one of the few beers I’ve ever bought a case of. Finally, just a reminder that we are giving away copies of my wife’s and grandmother’s book. 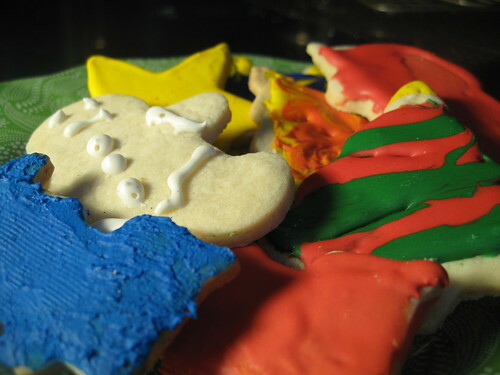 Just participate in our holiday traditions event. Share your traditions… Win a book! Frequent readers and subscribers to our feed will notice we’ve taken a couple of sabbaticals since we began this blog. Occassionally people have mailed asking, “So, what are you up to?” Well, this post is an effort at both making excuses and shameless self-promotion. Well, during one of these breaks, the wife – the funny and talented one – wrote a book: Cole Family Christmas. The tale is based on a true story told by my 88-year-old grandmother, Hazel Cole Kendle, who was the youngest of the nine Cole children. Cole Family Christmas tells the story of a very special Christmas my family experienced in 1920 when my great-grandfather was working as a coal miner in Kentucky. That year, he had received a promotion and had a little more money, and so the nine Cole children were able to write to Santa to ask for special gifts from the “Wish Book” (AKA the Sears catalogue). But when a freak snowstorm prevented the gifts from being delivered, my great-grandparents had to scramble to save Christmas. As the Cole children remembered it, though, the results of their efforts were even more inspiring – and more meaningful – than the store-bought gifts they had wished for. This story was passed down in the family for years, until at last my mother thought it should be memorialized in writing. Originally planned as a small pamphlet to be handed out at our annual family reunion, the project blossomed into a book geared toward families and younger readers. Cole Family Christmas is now a hardcover book, complete with beautiful illustrations, and has received broad distribution. We’ve been lucky not only to be picked up by online sources like Amazon, but also by brick and mortar places like Barnes and Noble. It has been a thrill for us to see Cole Family Christmas sitting in the children section’s at bookstores. As I hope you can tell, I’m extremely proud of my wife. As a result, I’m going to try to capitalize on my wife’s talent even more than usual. We are going to have a contest. As you might be able to tell, traditions around the holidays are a big deal for my family. 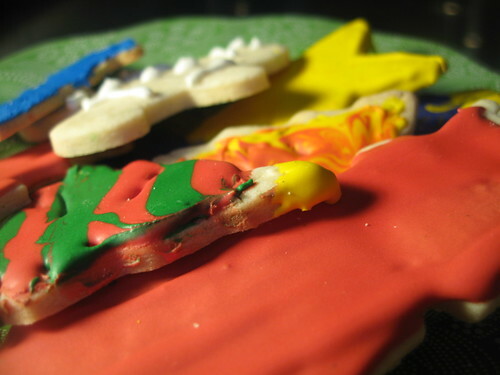 The one I remember most as a child is the annual cookie decorating contest. 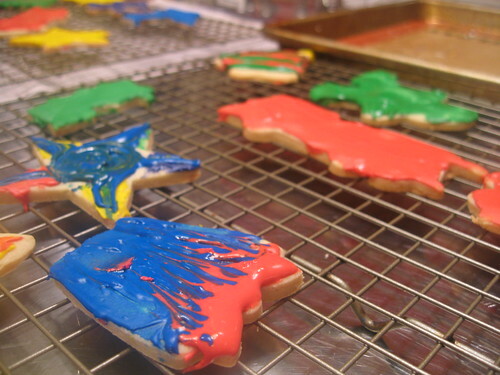 Like many families, we’d make dozens of cookies, and then a major competition would begin. Typically, the winner would be picked by the first non-participant to walk in the door — a rule that resulted in a hilarious, and controversial, choice when a teenage girlfriend of my older brother made the choice one year. 1. 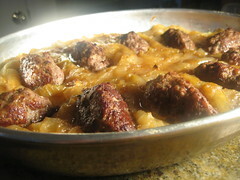 Post on your blog about your family’s food traditions for the holidays. It doesn’t need to be about Christmas. 2. Only one submission per blog. 3. Send an email to myhusbandcooks@gmail.com that includes your name, your blog’s name, a link to the relevant photo, and to the post in which it appears. 4. The best three (3) posts will get an autographed copy of the book. 5. The deadline is December 20, 2008 at 11:59 PM EST. 6. Round up will be posted on December 23, 2008. My family will choose the winners as soon as all the posts are up, and we’ll be sending out the books ASAP in hopes of getting you the book before Christmas day — unless you live outside North America, then we’ll do our best to get it there before New Years. I hope you enjoy our little competition and have a Merry Christmas! 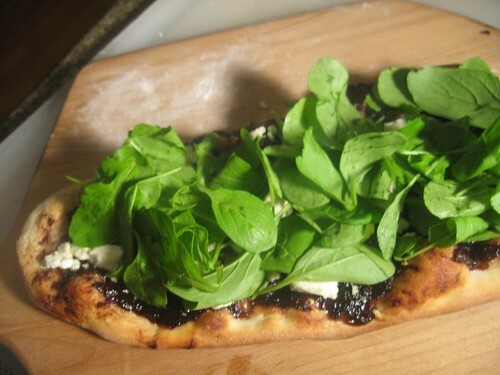 “Peet-zah.” Or, Onion Marmalade Flatbread. Then again, who could blame him? Pizza is good. Pizza is real, real good. 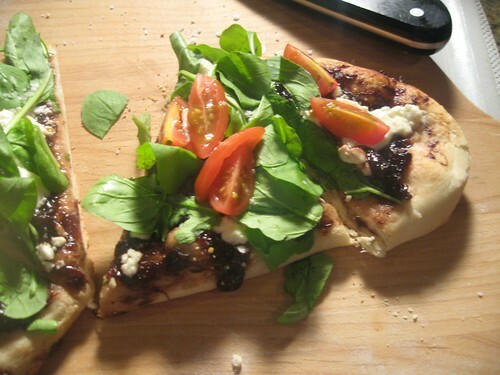 And this Onion Marmalade Flatbread thing… it’s out-damn-standing. First, it’s a looker. Mounds of fresh green arugula, studded with specks of ruby red tomato, call to you. 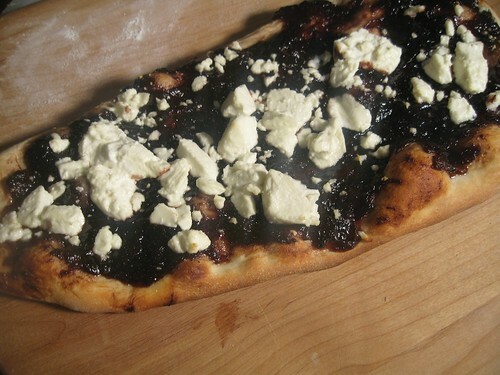 White, lumpy morsels of tangy goat cheese whisper your name. And a thick, sweet layer of rich brown onion marmalade makes eyes at you from its resting place on a thick, crispy crust. That was kind of weird. In fact, I think it could be made even easier — for us lazy cooks out there — by becoming bruschetta. That’s right: I think you could take all these fabulous pizza toppings and just mound them onto a crusty slice of French bread (that you’ve seasoned and toasted with olive oil of course). But don’t tell the husband that I told you it needn’t be pizza. He’d think I have a bias against pizza. And so what if I do! After all, who couldn’t resent the word that came out before “mommy”? Jeesh. 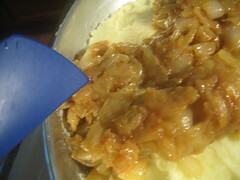 So, two weeks ago I was going on about the usefulness of onion marmalade. I gave you a burger and a sandwich as evidence of its true power as a pantry item. However, there are many more uses. 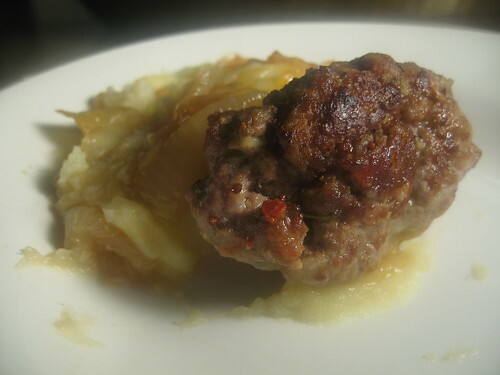 This recipe is perhaps my favorite… though only barely because I do love the other two so much. 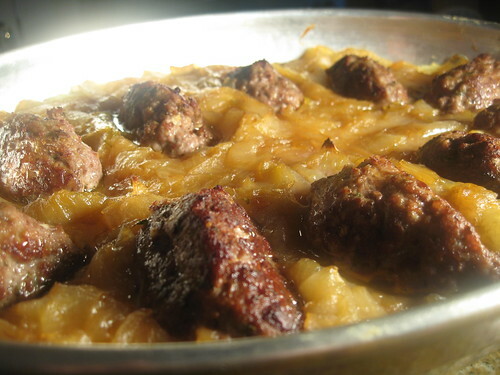 In this dish, you have sweetness and acidity from the marmalade. You have this great tang from the goat cheese. 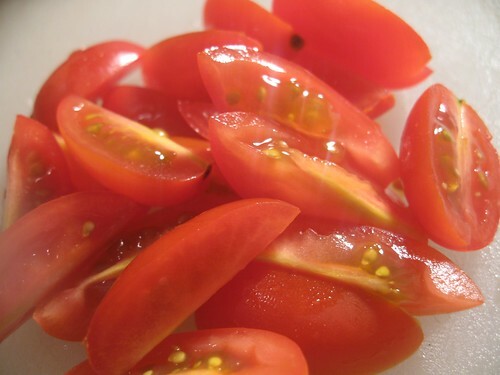 You have the freshness from the tomatoes and the peppery arugula (a.ka. “rocket” to my British friends). Finally, all this goodness rests on a thin, crispy crust that gives a truly satisfying crunch. In the end, sweet, savory, tangy, fresh, crunch… it is great. 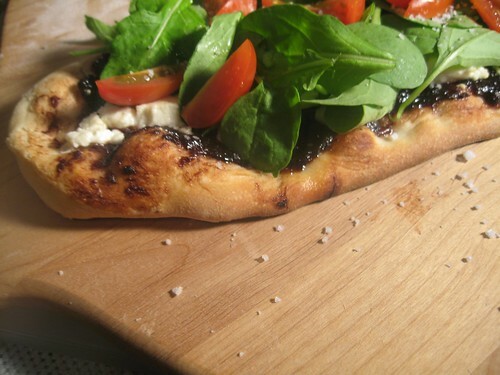 Oh, as for flatbread vs. pizza, I don’t think there is a difference, really. My big distinction is that pizza is round and typically has either olive oil or tomato sauce for a base. A flatbread I can roll out quickly and throw whatever I imagine onto it. Seriously, though, I think of flatbreads as a rhombus-square type shape. All squares are rhombuses, but not all rhombuses are squares. 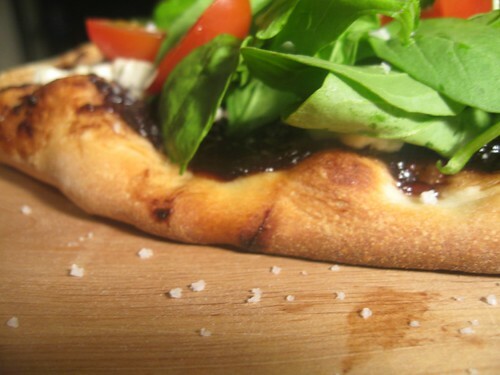 So, all pizzas are flatbreads, but not all flatbreads are pizza. (e.g. Indian naan is a flatbread, but not a pizza). That said, I’m welcome to be persuaded that I’m wrong! 1. After making the dough, preheat the oven to 500F. This can be done on a cookie sheet, however, we use a pizza stone placed at the bottom of the oven. 2. 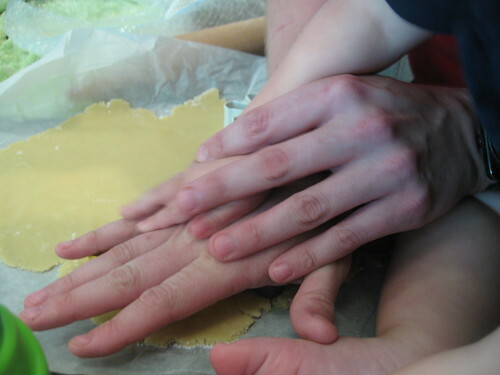 Roll out the dough into two 12’’ by 5’’ rectangles. Place about 3 tbsp. 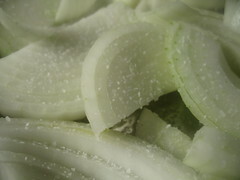 of onion marmalade on each rectangle. 3. Move the dough to the oven and cook for 5 minutes. Add crumbled goat cheese (e.g. 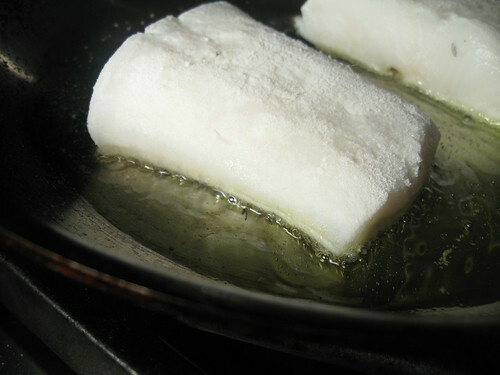 chevre) and continue to cook until the edges of the crust become a deep, golden brown. This should take approximately 5 to 8 minutes. 4. Remove from oven and top with arugula, grape tomatoes, and season liberally with coarse sea salt. 5. Wait about 2 minutes then slice and serve. 1. 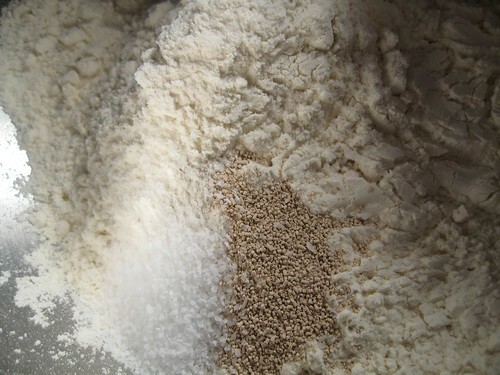 Place the flour, water, salt, and yeast in the bowl of a stand mixer with a dough hook. Turn on lowest setting and slowly add the water then extra virgin olive oil. 2. Let the dough come together, and then knead for approximately 5 minutes. 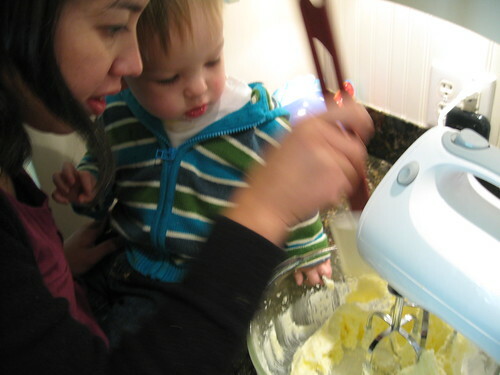 The dough should be mostly smooth and glossy when you remove it from the mixer. 3. 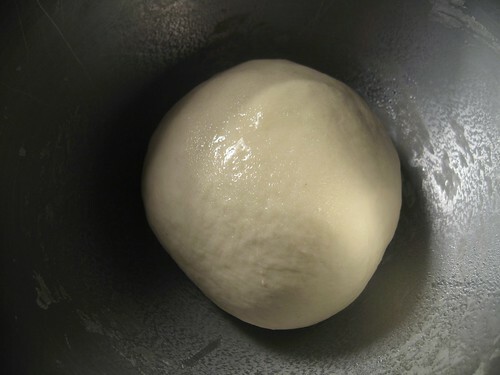 Shape the dough into a ball. Spray a large bowl and then dough with oil. Cover with a towel and place in a warm place until it doubles in size. This should take about 2 to 4 hours or overnight in the refrigerator. 4. Gently punch down the dough and knead briefly until it comes together. 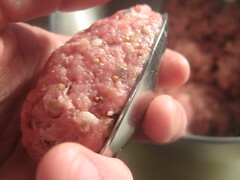 Cut into 2 pieces and form into balls. Let rest for 15 to 30 min. before rolling out as needed. 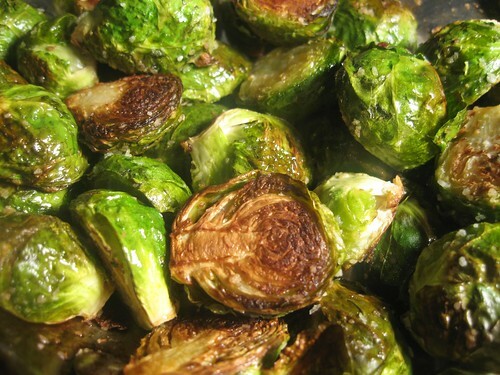 Roasted Brussel Sprouts: Try them, and be thankful! 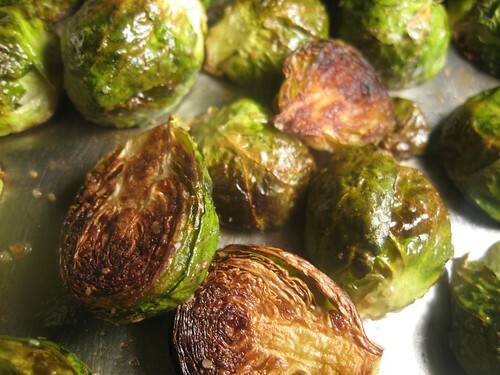 I love brussel sprouts. 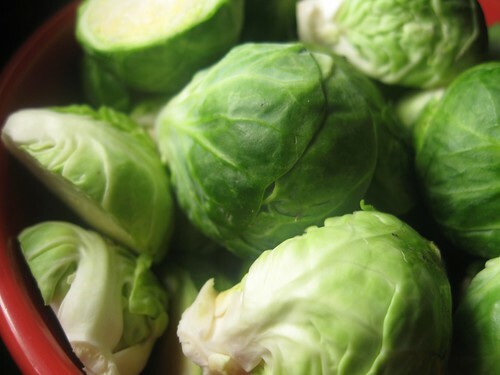 This is as surprising to me as it may be to brussel-sprout haters out there. 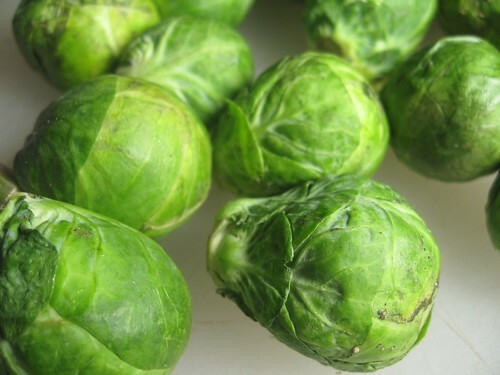 My first encounter with sprouts came under the worst possible circumstances: served as airline cuisine. Slimy, smelly and downright repulsive, they not only fouled my taste buds, they also fouled the air in the cabin. Those brussel sprouts were filthy little heads of cabbage, and I decided they might be the one vegetable that this vegetable lover loathed. Enter the husband’s cooking (again). Under his excellent watch, foul little brussel sprouts are made delicious. Roasted to toasty golden perfection, they are savory, satisfying little bites of veg. They even have a subtle sweetness akin to popcorn. And much like popcorn, I eat them by the handful. I admit, I’m all about the sides… and at Thanksgiving, sides are king. I suggest you add a little bit golden green to your groaning sideboard this Thursday in the form of roasted brussel sprouts. Try them. I think even the skeptical will agree: They are, indeed, something to be thankful for! As my wife stated, she’s about the sides. And I can’t blame her. On this day of turkey, you can see why the sides are bigger players then on most days. 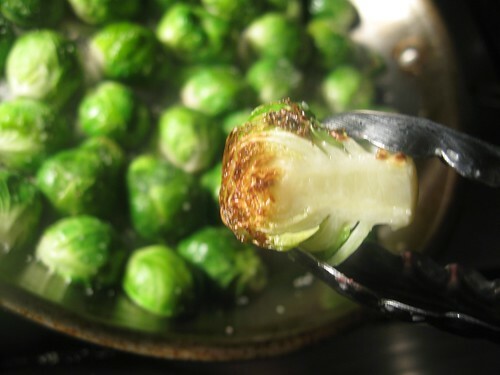 As a result, I’m giving you a quick, easy and delicious recipe for the day — roasted brussel sprouts. This is one of our family’s staple. We make this about twice a week during the fall and winter. And, as I’ve converted several people myself, I’m convinced this is the way to make even the biggest hater of brussel sprouts reconsider. We tend to think they smell, not like boiling cabbage, but popcorn. Have a Happy Thanksgiving! If you are not in the US, it’s a great holiday to celebrate what you have been so lucky to receive this year. So I wish you Happy Thanksgiving as well! 1. Slice the brussel sprouts in half through the stem. 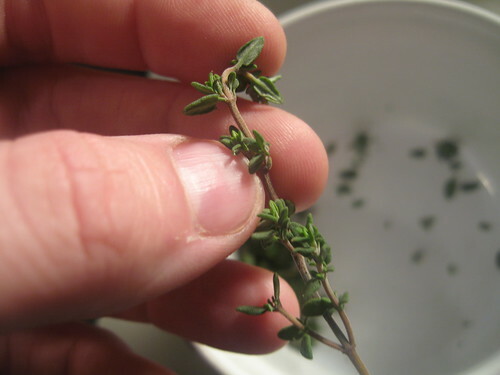 Trim off any rough part of the stems and pull off any bad (brown or with holes) leaves. This can be done hours in advance. 2. Preheat the oven to 400F and turn on the convection feature. If your oven doesn’t have this feature, then preheat to 425F. 3. Toss the prepared sprouts in olive oil. 4. 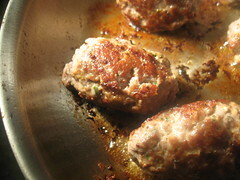 Heat a large, oven-safe pan over hight heat and coat the bottom of the pan with olive oil. Once the oil is shimmering, add the brussel sprouts to the pan. Work quickly to make sure the cut side is down. This should cause a sizzle. 5. Liberally salt the sprouts. 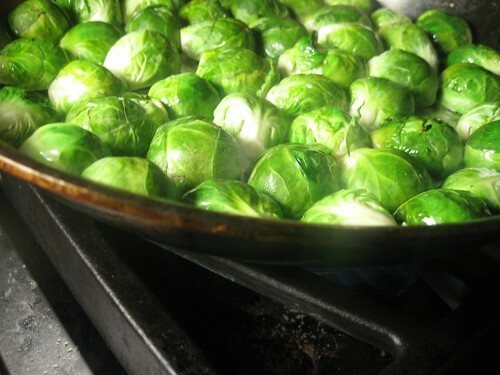 Keep the pan on the stove over high heat until the sprouts begin to brown on the hottest parts of the pan. 6. Move the pan to the oven. Check about 10 min into the cooking. Flip the sprouts over. They should be very dark brown on the bottom. Cook for another 10 min or until all the sprouts are completely golden. Note: If you are doing a very large batch or don’t have an oven safe pan, I recommend using a cookie sheet instead. Simply use two burners of the stove, and place the sheet over medium high heat. Spray the pan with a vegetable oil spray. Add the sprouts cut side down and then move to the oven. Takes about 20 min per side. 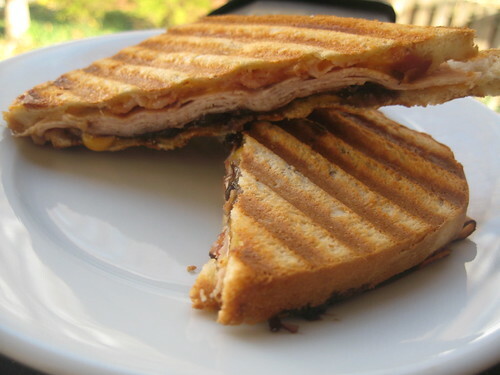 Turkey & Cheddar Panini (with onion marmalade) to the rescue! Yesterday, we brought you the secret of our house burger… onion marmalade. Today, we bring you the secret of our favorite sandwich… it is, er, onion marmalade. Pictured above is the sandwich that makes us happy. Especially on those nights. (You know the ones I mean.) Everyone has them. Especially after you’ve had kids. Those are the nights when you know you need to make dinner. But you look at each other, look at your little ones, and realize that – shock! horror! – you don’t actually want to cook. Even I have those nights… nights when the wife might grudgingly enter the kitchen, rather than give in to ordering or going out. Those nights are when we turn to this sandwich. A few little tips. First, the cheese is important. 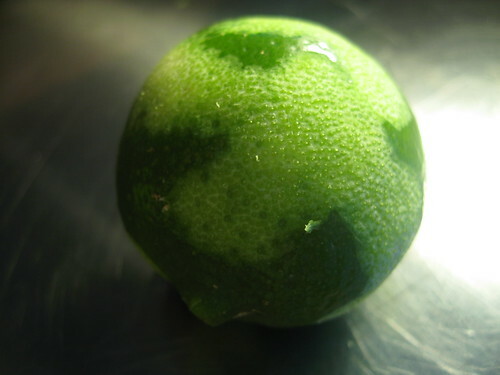 In addition to being tangy and tasty, it’s a binding agent. There are two very thin layers that hold the sandwich together and keep the marmalade from bleeding through the bread. You don’t need a lot of cheese; spread it out and keep it thin. Also, don’t try to slice the sandwich fresh from the heat of the press. If you do, the cheese will still be molten and it will cause the sandwich to shift around. Wait 2 minutes before slicing. 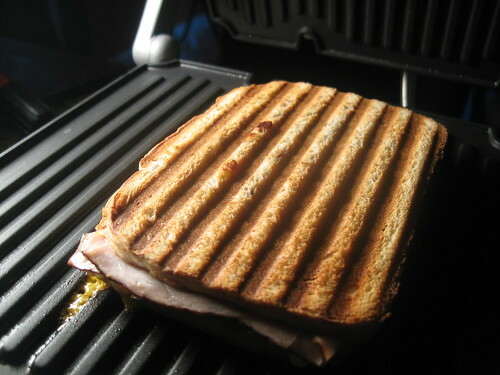 Second, to me, the joy of a panini is the crunch as much as the flavor. After many trials, we know that if you add too much turkey, it becomes just a hot sandwich – not a panini. No more than three thin slices of turkey from the local deli seem to yield the best results. Finally, the wife wanted me to say that the bacon is 100% optional. If you have no interest in breaking out the pan, you can have something just as delicious without it. 1. Heat the panini press. 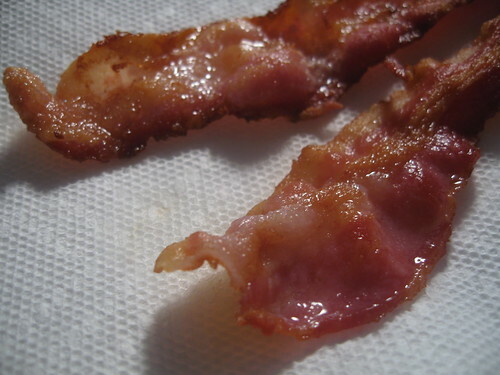 Fry the bacon and let drain. 2. 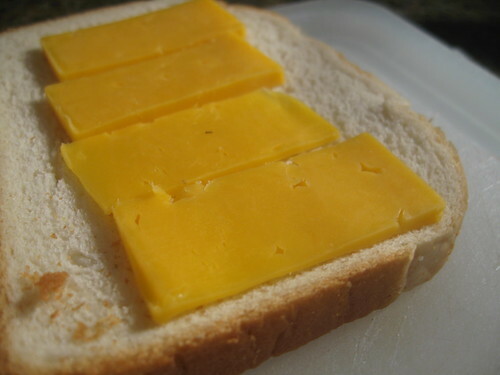 Slice the cheese thin and place enough to nearly cover the bottom slice of bread. 4. 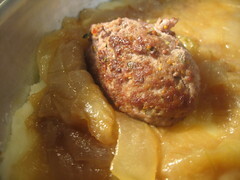 Add the turkey next, then about a tablespoon of the onion marmalade. 5. Finish off by adding another thin layer of cheese and the top piece of bread. 6. Toast until golden brown. Let cool for 2 to 3 min to allow the cheese to firm before slicing.